We offer the finest cleaning equipment used by professionals and have been for 40 years. Watch how a barrel sanitized by the Optima Steamer compares to a barrel only washed with water and chemical. Steam can remove brettanomyces, zygo, tartrates and rehydrate (swell) barrels at the same time. Save time and water with the Optima Steamer. When it comes to those difficult cleaning jobs, having these specialized “wands” in your cleaning arsenal are the ideal solution to making your pressure washers even more effective! Slippery engine grease and oil on your shop floor. Caked-on mud under your truck. Dirt and other unsanitary “stuff” building up in hard-to-reach areas. By using specially-designed pressure washer “wands” to easily reach tough-to-clean places, you can make your job easier, faster, and even safer. MAINTENANCE MINUTE: Smart Tips to Help You Get the Best Results from Your Equipment! To ensure peak operating performance on a cold-water pressure washer, and to extend its life, follow these 4 smart steps. Check the pump oil level regularly and change after 300 hours of operation or annually. Inspect the inlet screen weekly for debris and clean or replace as needed. Inspect quick connects and O rings for cracks or damage monthly. Replace annually or as needed. Inspect high pressure nozzles daily for blockage and replace every 6 months. Engine oil level should be checked daily and changed after 100 hours of operation. Oil filter should be replaced every 50 hours. Inspect the air filter every 50 hours and clean or replace monthly. If applicable, replace the fuel filter after 500 hours or every 6 months. Just as you maintain your car, practicing these simple yet essential maintenance steps will save wear and tear on your machine, and save you money and labor. Have a maintenance question? Send us an email at info@hotsypacific.net we'll follow up with you. Steamericas will feature the Optima Steamer SEII model and two types of barrel cleaning tools. Join us at booth 1905 to see product demonstrations. Can You Afford the Down Time? Cleaning equipment rarely “just fails”. Instead it gradually loses pressure and heat, making it less and less effective and requiring that the operator use more water, energy, and detergent, as well as taking more time. All of which add up to sneaky hidden costs – kind of like pouring your money down the drain. Now that you know, are you willing to continue wasting this money? In response to customer requests, Hotsy Pacific is introducing its new Smart SMP (Scheduled Maintenance Program), designed to keep your machine operating at the optimal level and replace worn out parts before they break. Since there are different wear parts and key things that need to be addressed for each type of machine, at the proper intervals we will replace major components based on the “Mean Time To Failure” specs we have from the manufacturers. An added advantage is that you'll be able to more effectively plan your budget because you'll know your maintenance costs in advance. Best of all, you'll have the peace of mind of knowing there's one less equipment performance issue to worry about. Stop those hidden costs of failing equipment from hitting your bottom line! Schedule your Smart SMP with Hotsy Pacific today! We've secured a limited number of floor passes to this year's Wine Expo in Sonoma County. We'd love you to come along as our guest. To get your complimentary ticket (worth $35), click on the button below and enter the promo code HOT235 (235 being our booth number). Please choose the Expo Floor Pass ticket option when you book. Water has become the most regulated, costly, and misused resource within companies. It is also the area where the most efficiency can be gained. A basic understanding of each technology along with working with a qualified professional will insure that the water treatment system provides the desired results. Reactive vs Scheduled Maintenance – Which is better? Companies that rely on equipment typically employ either a reactive or preventive approach to maintenance. Reactive maintenance is fixing things when they break. This approach can sometimes save money short term but often ends up costing even more in the long run. Scheduled maintenance is a planned program where maintenance tasks are conducted routinely to avoid larger, more costly fixes in the future. Cost Savings - Companies that rely solely on reactive maintenance are essentially waiting for a problem to happen, and this can often be a costly move. Unplanned downtime can result in idle employees, halting the production line, missed deadlines, and – for property managers of hotels, resorts, school campuses and other consumer facing industries – long-term damage to their brand and image. An unexpected failure can result in having extra costs including overtime charges for technicians and expedite fees for overnight delivery of parts. A scheduled maintenance program is designed to avoid these types of repairs by replacing worn parts before they break. Efforts should be focused on preventing equipment failure rather than emergency fixes. Maintaining equipment is less costly and quicker than large repairs. Improved Safety - When equipment isn’t working in optimal condition, it creates many hazards, unsafe working conditions and even emergency situations where workers are injured. Scheduled maintenance improves the safety of equipment and therefore the safety of company workers resulting in fewer on the job injuries and accidents. Decreased Equipment Downtime - While almost all maintenance tasks require some equipment downtime, a scheduled maintenance program can decrease and optimize that downtime. For example, a company doesn’t experience unexpected downtime as much as if they were to rely solely on reactive maintenance. Decreasing equipment downtime is a benefit that saves time in maintenance and day-to-day operations. Improved Reliability - Scheduled maintenance can also help a company to be a more reliable business partner. Customers can count on a company to deliver products, materials, or service on time, without unnecessary delays. By always offering a reliable product or service, a company can enhance its customer service and improve its reputation. Preservation of Assets - Most equipment these days is certainly not cheap, but the better a company cares for its equipment, the longer it will last. Scheduled maintenance will prolong the life of equipment so a company can get more hours out the equipment, resulting in reduced costs and increased profit. The numerous benefits of preventive maintenance has caused many maintenance managers to shift from reactive maintenance to a regular, routine scheduled maintenance plan meant to prevent problems and optimize equipment. Scheduled maintenance is the best option for companies that want to succeed long term. Water reduction mandates are inevitable. That means your business needs options — and a plan. Assembly Bill 1668 and Senate Bill 606 are now forcing water districts to think hard about water conservation measures. Reducing the amount of water that businesses use will inevitably be a key factor — and that means your business needs a water recycling plan. But even as they’re set to become a necessity for business, there remains a lot of myths and confusion around water recycling systems. 5) No maintenance is needed - Water treatment systems vary in size, type, and treatment level but regardless of the system maintenance is required. In addition, constant monitoring is necessary to insure the desired water quality is achieved. 4) Single system for treatment and waste water recycling - Systems range from simple to complex and are based on the number of impurities contained in the waste water and the desired use on the discharge side. Obtaining wash quality water requires multiple technologies and stages depending on the condition of the water entering the system. The stages include chemical treatment, mechanical separation, chemical refinement, and filtration. 3) Potable (Drinkable) water is not achievable using Recycle Water - Potable (Drinkable) water is achieved by using multiple technologies and steps including ozone, ultraviolet disinfection, and carbon filters. The final process typically involves membrane filtration. The systems are normally only cost effective when there is a shortage of potable water readily available or the value of conserving water is considerable to the individual or company. 2) Systems are fully automated - Although many automated features are available for waste water recycle systems, there are not any systems currently available that feature full automation. Monitoring of filter pressures, co-ag pumps, Ozone production and backwash timers are just a few of the requirements to insure proper operation of your system. Monitoring of the system usually takes less than 15-20 minutes per day by a trained operator. Monthly maintenance requirements may require changing out chemicals, filter paper and testing of the water chemistry. 1) Recycle up to 100% - Recycling 100% of your waste water difficult to achieve because of evaporation and runoff during the washing process. Up to 30% of your wash water will be either evaporated or leave the wash area with the equipment which is generally is a good thing as it allows fresh water to be introduced into the system which lengthens the time between when the waste water will need to be disposed of and the system restarted. The floor of any facility is the resource that is used the most. Yet it's the one that is considered the least. Oddly enough floor care is also the area where cleaning occupies (and wastes!) the most time, energy and water. We offer a wide range of solutions designed to improve cost control, boosts productivity, and maximize useful life. Here are a few key items to consider in determining the right machine for your needs. 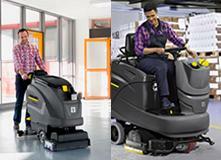 Dramatically reduces cleaning times and labor required for the cleaning process. Cleans 40 square feet in one minute that would take 8 minutes using a standard spray wand. Models range from compact scrubbers to ride on units, all designed to make cleaning as simple and convenient as possible. Click Here to view the most popular model. The best part is in one year you can choose to finance the purchase or a portion of it and roll the balance into monthly payments. No prepayment penalties apply at any time during the period. Now that is a fair deal and a great way to manage funds. Optimizing these improves cost control, boosts productivity and safety, and often extends equipment life as well. Wash water recycling not only saves money in sewer costs, it may also eliminate potential fines and regulatory litigation. At Hotsy Pacific, we sell, service and repair a wide variety of water recycling and water treatment systems that recoup up to 75% of waste water in applications and industries such as Food Cleaning; Equipment and parts cleaning; food processing; Tank Cleaning. Water Treatment is a broad term and can be as simple as filtration or complex as waste water recovery and treatment for re-use. In addition there are multiple processes and systems required to accomplish a desired outcome. There are misconceptions on the differences between steamers and hot water pressure washers and many times operators and purchasers refer to them interchangeably which adds to the confusion. It starts with the fact that steam technology and its use as a cleaning vehicle has been around much longer than pressure washing. Thus the term steamer or steam cleaner has carried through to hot water pressure washing. Given that the word steamer is also widely use in other industries and as an appliance to take out wrinkles in clothing we thought we clear things up a bit. Both technologies serve different cleaning needs and the benefits and advantages need to be examined thoroughly. In some instances both are needed to complete a cleaning task efficiency and thoroughly. Hot water pressure washing uses the volume of the water to move the debris, similar to a broom. The pressure is used to dislodge or break the adhesion of dirt and debris from the surface and hot water cuts through grease and oils to speed up the process. Steam on the other hand uses the steam's expansion to accelerate water droplets, at the boiling point, to a high velocity to loosen the dirt and debris from the surface. The closer the steam cleaner's nozzle is to the surface to be cleaned, the higher the temperature and velocity of the water/steam mixture, and the more rapid the cleaning action. There are numerous factors to consider so to determine which process best fits your application contact us to discuss further. Each month we provide industry and department specific Best Management Practices. June 16, 2015 - State and federal officials today announced the outlines of a revised plan for managing water flows in the Sacramento River for cities and farms while keeping enough cold water in Shasta Reservoir to avoid high temperatures in the river that could be catastrophic for endangered winter-run Chinook salmon. The Sacramento River Temperature Management Plan, which is required annually, guides the release of water from Shasta Reservoir to maintain healthy fisheries during the summer and fall, when water temperatures rise. In this fourth year of extended drought, with low reservoir storage levels and higher-than-normal predicted summer temperatures, the plan seeks to prevent another catastrophic loss of this year's class of juvenile salmon. Remove debris from the floor prior to scrubbing. Install auto shut off timers on applicable hoses. What will happen when you're required to reduce water by 25% or more? Now is the time to investigate options and establish a plan for meeting water reduction mandates. Hotsy Pacific has been providing water reduction solutions for almost 30 years. Services include consulting all the way to full implementation and any of the equipment needed in between. We can help you with system improvements that will enable you to use less water, or capture the water you're using for recycling and re-use. We have turn-key water treatment systems in stock, or we can scope, design and manufacture a system for you. Here are just a few of the areas where we can help you to improve your water efficiency. Required to reduce water by 25% or more? Watch how the Humane Animal Welfare Society trusts Hotsy to keep their kennels clean! Only a few days remain to blow a hole in your 2014 tax bill! If you're still thinking about purchasing equipment this year, I have, what might be, a good reason to do it now. It seems, due to the impenetrable machinations of our Congress, you can claim a 100% tax deduction on capital purchases up to $500,000 in value --- but ONLY if you make the purchase by year's end! We are offering 6 months same as cash to make the decision easier on your cash flow. Three locations to better serve your cleaning needs. Karcher is taking efficiency to the next level offering multiple settings including an environmentally friendly setting that utilizes energy and resources intelligently and efficiently. This setting reduces water consumption, resulting in less waste water. It also features an extended run time mode, increasing operation by 50%, and reducing noise by approximately 40%. It's integrated sweep bin, allows the BR 35/12 C Bp to conveniently sweep, scrub and vacuum up small debris and waste water with one pass over floors making this unit a must have for winery cellar, production & high traffic tasting room areas. 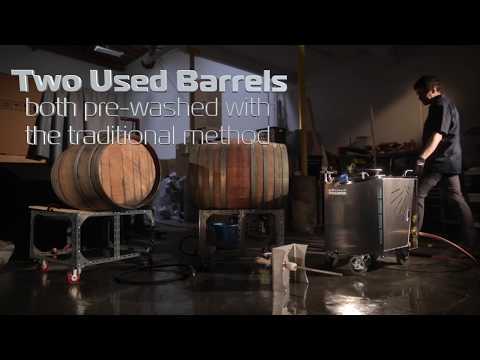 A FASTER WAY TO SANITIZE BARRELS THAT SAVES WATER!! Hotsy Pacific introduces the Barrel Steam Wand accessory for the Optima Steamer line of products used to sanitize wooden barrels. Since the all-stainless-steel Optima Steamer DMS (DSS) and EST-S models have launched in 2012, we have received many requests for a wand built specifically for steam. Existing products on the market were originally made for high pressure washers and couldn’t accommodate the specific needs for steam which is low flow and pressure. The Barrel Steam Wand is carefully designed to maximize the performance of the Optima Steamer to save steaming time while achieving the right temperature to remove unwanted micro-organisms. It features a stable & self-standing rack and a digital temperature display to let users know when sanitation is complete. With the new wand, internal barrel temperature reaches 230°F just in minutes. With the right steam machine and the right tool, barrel sanitation will become an easy task. IS YOUR CLEANING EQUIPMENT READY FOR CRUSH? You are ready but is your cleaning equipment? Here at Hotsy, our hearts go out to those in the Northern California Napa region who may have sustained damage in the recent earthquake whether it be personal or professional. We are here for any clean up needs you and your business may have and are ready to assist in getting your operation back up in running in a timely manner. Did you know that steam allows for better cleaning? First, it penetrate crevices and detailed corners of a tank or barrel better than water. Second, the steam kills bacteria, fungus and germs without using harsh chemicals. Steam sanitizes creating an environment free of contaminates that could effect the wine. And third, you’re saving a lot of water in the environment - especially for those drought stricken regions, and the water is not being thrown back with soap in the drain system or rivers. Hotsy Takes it ALL Off! Vineyard & grape growers have learned to trust only one name in high-pressure cleaning equipment – Hotsy! When it comes to cleaning harvesters, crushers, destemmers, bottling lines and tanks, a Hotsy hot water pressure washer rises to the task. Hot water cleaning is highly effective, and actually speeds your cleaning. There are a number of Hotsy pressure washers that are popular with wineries. 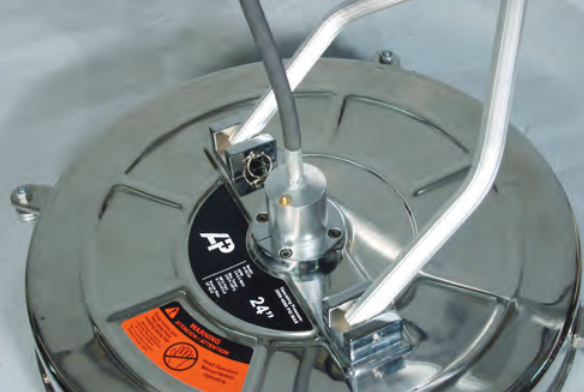 Many use portable LP Gas-Fired models to move easily around equipment, while others choose a stationary machine. We are experts at matching equipment to your needs, so you don’t have to make the decision on your own. We at Hotsy Pacific can suggest many additional items to help you clean more effectively. For instance, we offer the Gamajet cleaning system which is ideal for cleaning inside barrels and tanks. A surface cleaner quickly washes flat surfaces, like concrete floors stained with grape juice. The HOT-sy Summer Sale is ON! Sizzling Savings on popular Hot Water pressures so BIG & BRIGHT you're going to need shades! Farmers, Ranchers and Vintners Rely on Hotsy for their vineyard equipment cleaning needs as there is only one pressure washer tough enough to handle the job – Hotsy. Since 1970, Hotsy has manufactured pressure washers rugged enough to meet the intense demands of those in the agriculture industry. With the great outdoors as your office, farmers know dirt, mud and muck are just part of the daily routine. Check out our incredible sale this season and recieve $500 OFF select models! Give us a call to discuss how you can use steam to reduce your water usage when sanitizing barrels and equipment. Schedule a free demo and see how nothing cleans like a Hotsy! Special financing available on our most popular models. For quotes and additional information please give a us a call 707-585-0100. More information on Hotsy Hot Water Pressure Washers. Rebates offered March1 through April 30th. Join Hotsy at the World Ag Expo! We have special show pricing with offers that you won't find any other time of year, and our Hotsy MONSTER Truck - Raminator - is on display at booth AB1. SPECIAL SHOW PRICING - LOWEST PRICES OF THE YEAR! Water treatment systems vary in size, type, and treatment level but regardless of the system, as is the case with any equipment with moving parts, maintenance is required. In addition, constant monitoring is necessary to insure that the desired water quality is achieved. Assigning the responsibility and creating a log sheet of readings is a great way to insure that monitoring is being completed on a regular basis. Preventive maintenance programs when completed on a regular basis will reduce down time and costly repairs. Water treatment systems vary in size, type, and treatment level. Most companies have numerous types of treatment systems available. Determining what system will work best for your application requires some expertise and testing of your waste stream. Most successful systems utilize a combination of technologies to accomplish successful recycling. Too often, a company will purchase a packaged treatment system only to find it does not meet the needs of their operation. To be successful may require a pretreatment solution, a treatment solution, and a post treatment solution. The best way to insure success is to work with a company that is deep in knowledge of handling waste water solutions. Testing of the water and designing a system specific to your application is the only recipe for success. Potable (Drinkable) water can be achieved from Recycled Water by incorporating different technologies with steps which include ozone, ultraviolet disinfection, and carbon filtering. Typically the final step involves membrane filtration. Keep an eye out for the top 2 Myths! Water Maze equipment treats and recycles wash water for reuse or safe discharge to sewer. Evaporators, water recycling, bio remediation and electro coagulation technologies are available. most popular model with wineries. Available in all Stainless Steel. The Alfa Laval Gamajet tank cleaning device combines pressure and flow to create high impact cleaning jets. The Alfa Laval Gamajet BB tank cleaning device combines pressure and flow to create high impact cleaning jets.